Having introduced a number of new concepts in the creation of its flagship, the Discovery 67, British builder Discovery Yachts, has now created a slightly smaller yacht that is easier for a couple to handle. 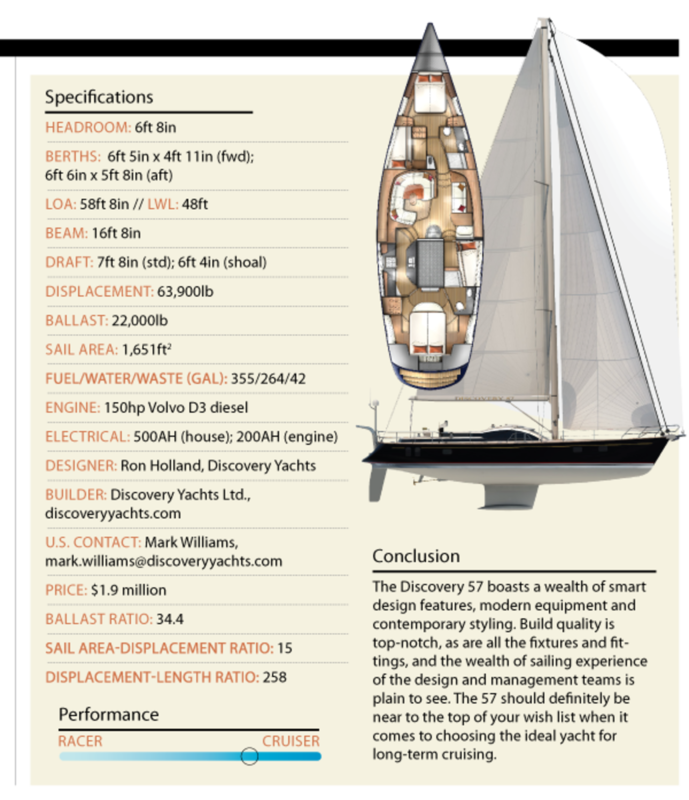 Like its predecessor, the new Discovery 57 was created by naval architect Ron Holland and Discovery’s own in-house design team. The Discovery 57 is vacuum-bagged with isophthalic gelcoat and vinylester resins for maximum strength, integrity and water resistance. The hull layup incorporates a foam core and longitudinal stringers with structural rings athwartships for maximum stiffness. Additionally, the bow area is reinforced by interweaving Kevlar into the woven mat. There is also a watertight crash bulkhead. The hull is guaranteed against osmotic damage for five years. The deck is cored with plywood, with stainless steel or aluminum backing plates in all high-load areas. The hull-to-deck joint is bonded with structural adhesives and is through-bolted with stainless steel fasteners. 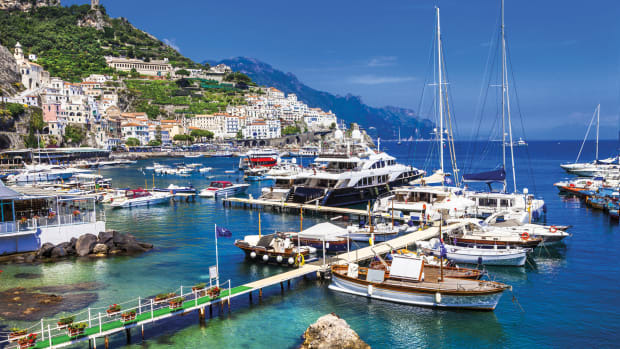 All tanks are polyethylene for long-term reliability; marine-grade tinned cabling is used throughout to reduce corrosion in the electrical system; LED lighting is standard; all bulkheads are securely bonded into the deck. The list of positive features goes on and on. 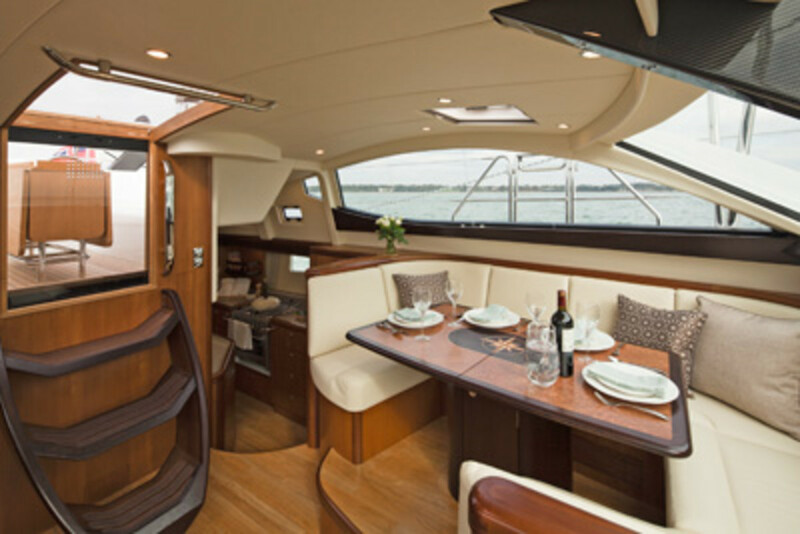 Despite its center-cockpit layout, the Discovery 57 still has enough deck space aft to keep the twin helms separate from the seating area, where there’s room for six around a substantial teak drop-leaf table with an insulated icebox and cup holders. Each helm has a substantial binnacle display pod, seat and foot stops. The spacious afterdeck is ideal for sunbathing and has two lazarettes large enough to hold bulky deck gear, watermakers, dive compressors or hot water heaters. Access to the water is through a stern gate down several wide teak-covered steps. The clever electric dinghy davits telescope outward and lower the tender into the water just behind the folding boarding ladder on the bottom swim step. The decks forward are clear of obstructions, thanks to a self-tacking jib and genoa tracks that are mounted atop the teak caprails. 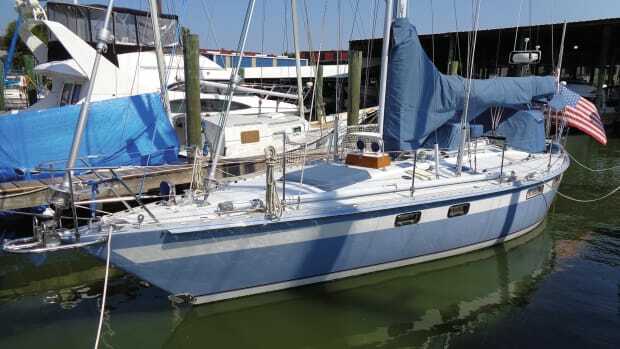 The foredeck is well organized, with a large rope/sail locker forward of a watertight bulkhead, a deep chain locker and a heavily-engineered stemhead fitting carrying twin rollers, two Reckmann electric furlers and a tack block for an asymmetric spinnaker. The keel-stepped double-spreader, alloy mast is supported by discontinuous cap, intermediate and aft lower shrouds made of low-stretch Dyform wire. A carbon spar is optional. 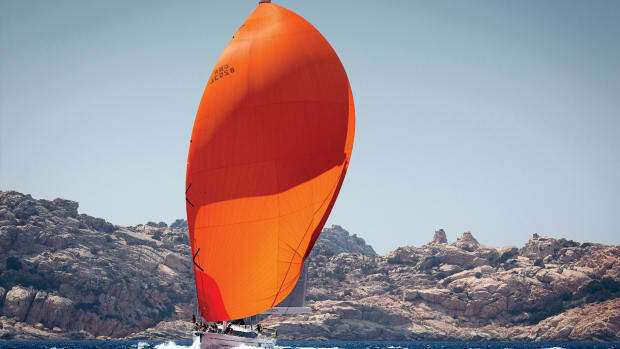 The Solent rig pairs a self-tacking high-aspect jib for ease of handling with a 140 percent genoa for additional horsepower. 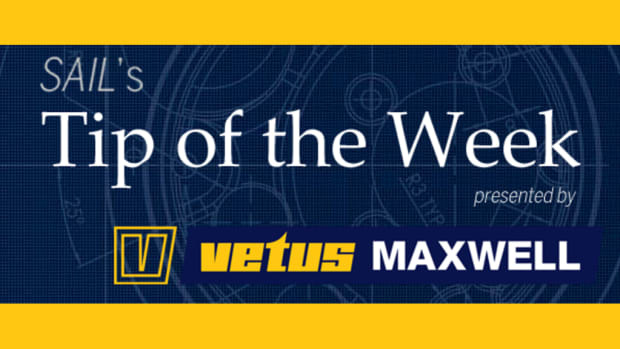 Electric in-mast mainsail furling is standard, but a battened slab-reefed main can be specified. The mainsheet traveller runs along the afterdeck and sheets to an electric winch on the coachroof, where it is unfortunately out of reach of the helm. The jib is also controlled by a single sheet on a coachroof winch. The genoa sheets are led aft to electric primaries, just forward of the helms. The standard layout includes a vast, well-appointed owner’s suite aft, a large guest suite forward and a two-bunk crew cabin amidships. If this arrangement doesn’t suit you, Discovery Yachts will happily modify the layout to fit your needs. The panoramic views from the elevated saloon seats are a real boon, both under sail and at anchor. Plush leather-covered settees surround the folding dining table, enabling six to dine in comfort, or four to relax over coffee when it’s folded. Opposite, close to the full-size chart table, is a pilot berth with chart stowage in drawers below. The navigator’s seat is also raised and enjoys fine views through the large windows ahead. A little farther aft is a step-down utility area that houses a washer/dryer and the electrical control center, comprising a 5ft-tall breaker panel. The walk-in engine room is well organized with excellent maintenance access. The galley, located in the corridor to the aft cabin, is well proportioned and features Corian worktops and solid wood trim. Though linear, there is plenty of physical support when cooking or preparing food underway. The owner’s suite aft is spacious, warm and inviting, with several spacious lockers, a vanity table and a settee. Light and ventilation is excellent, thanks to a pair of large hull windows, two overhead hatches and numerous opening ports. To starboard is a luxurious head and shower stall with electric-flush toilet, heated towel rail and Corian surfaces. Forward from the saloon are the crew cabin, heads and guest suite off a short corridor. 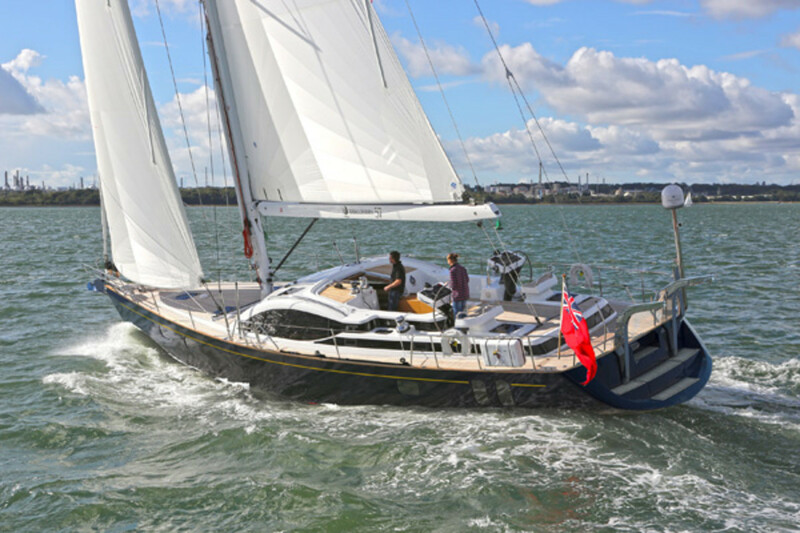 Despite being at the larger end of yachts that can be handled by a couple, the Discovery 57 proved to be agile, safe and easy to sail, even on a breezy autumn day with wind gusting in the high 20s. Initially, we hoisted full main and jib—luffing the main in the longer gusts and relying on the boat’s ample ballast, deep bulb and generous hull form to keep her stiff and upright. 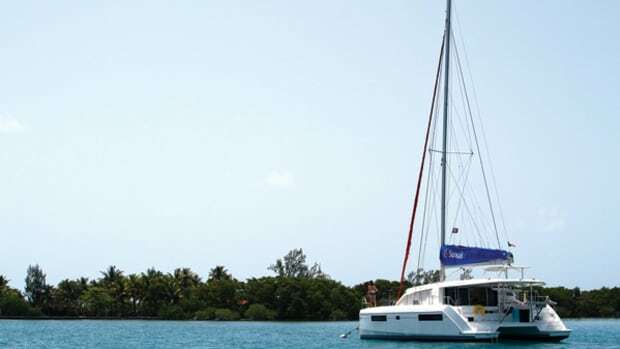 Close-hauled, the Discovery 57 powered through the short chop with a shrug of her broad shoulders, the log moving from 7.2 to 8.4 knots at a 33- to 38-degree apparent wind angle. Later, with a single reef in the main, she developed a balanced and predictable stride more suitable to logging a long run on passage. Our speed dropped to 6.2 knots hard onto the wind, but she had no trouble keeping on course. Bearing away to a close reach under full sail, we once again saw the log hovering in the low 9s, and with 24 knots of wind dead on the beam she flew, despite the strong gusts. Cheekily, we unfurled the genoa once the wind was aft of the beam, but it wasn’t long before I was fighting the helm and zigzagging down our course—no surprise, as putting up an additional 1,200ft² of canvas in these conditions was verging on plain recklessness. Nonetheless, in spite of being overpowered, the boat still stood up to her sail well and only once did the rudder start to lose its grip on the water. When not overpowered, the boat sped along on a broad reach at a comfortable 8.2 knots, tracking as if on rails thanks to her deep appendages, so that only the lightest touch on the helm was needed to keep a steady course. The Discovery 57 Volvo diesel is incredibly quiet, thanks to superb engine insulation and a vibration-free Aquadrive shaft coupling. Our test boat was equipped with a three-blade Brunton folding propeller, which drove her to 8 knots at 2,400 rpm. 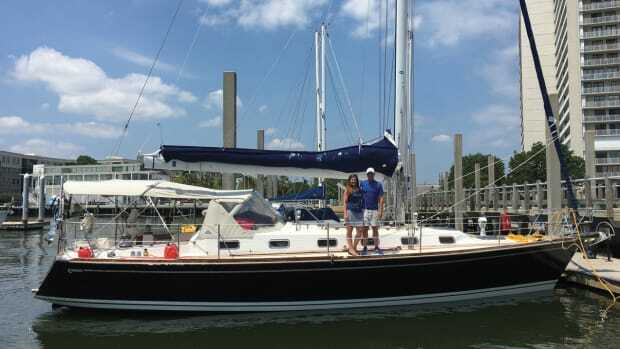 At cruising revs, she carries enough fuel for a range of 1,200 miles in calm waters. 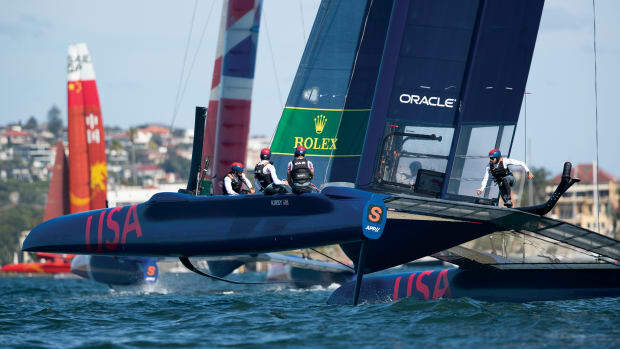 The boat maneuvers well enough in tight spaces, turning in about 1½ boat lengths.  However, shorthanded couples who regularly have to make their way in and out of a tight marina berth will appreciate the boat’s 10hp MaxPower bow thruster.